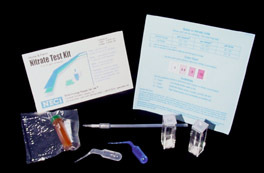 The home Nitrate Test Kit (C-NTK) provides the homeowner or farmer with a simple and safe kit for testing nitrate content of any water source (wells, animal ponds, etc.). The C-NTK is easy to use and only takes a few minutes to get results. The C-NTK is based on using an enzyme, Nitrate Reductase (NaR) from corn plants, to convert nitrate to nitrite with the natural coenzyme, NADH, to drive the reaction and non-toxic dyes to develop color with nitrite -- C-NTK contains no heavy metals like other kits for nitrate testing and is safe for you to use and environmentally benign. The Nitrate C-NTK for Home/Farm Water Testing contains no environmentally harmful components and is completely safe to use. NECi's nitrate reductase (NaR) is used in these kits. The principle is that the enzyme nitrate reductase using its natural electron donor, NADH derived from yeast cells, reduces nitrate in the water to nitrite. Environmentally safe dyes are used to detect the nitrite. After the color of the dye-nitrite complex fully develops, the color of the Nitrate Test is compared to a Nitrate Standard run at the same time as your water sample. An easily to use color chart for estimating the nitrate content of the water being tested is also provided in the C-NTK. Finally, the contents of the C-NTK are safe to discard in the sink or any drain after you have used it to estimate your water's nitrate content. The paper and plastic components of the C-NTK can be recycled. Thus, the NECi C-NTK is a sustainable solution to Home and Farm Nitrate Testing. Enzymes are nano-scale machines for accelerating reactions with no undesirable side-products. Enzymes are such efficient machines that only tiny amounts are required of the Nitrate Reductase used in the C-NTK. Enzymes are central components to a wave of new testing methods for environmental pollutants, which will eliminate the need for using toxic chemicals for environmental testing. For example, prior to the introduction and sale of Nitrate Test Kits based on the enzyme nitrate Reductase (NaR), nitrate testing was done with cadmium and other heavy metals (in most cases), which are toxic in the environment. Thus, enzymes are making it possible for environmental diagnostics to be a better part of the solution to environmental pollution rather than just another contributor to the problem. This is especially true in field testing for Nitrate where no other commercially available method of testing for nitrate is also safe for the environment and the person doing the nitrate testing.